I knew I was going to be a writer long before I knew I what kind of stuff I was going to write. In spite of a couple of plays that got produced, it took two lousy unpublished novels, a handful of even lousier unpublished short stories, and a lucky chance that led to a six year stint as a political journalist to make it clear that I was going to write about the people in the world around me, not the messy characters inside my head. In the many years since my first stab at fiction writing in elementary school, I have spent a lot of time thinking about, and honing my craft as a writer. And I’ve spent a lot of time teaching students to write well. So when people single out my writing for praise, I am particularly pleased and flattered. 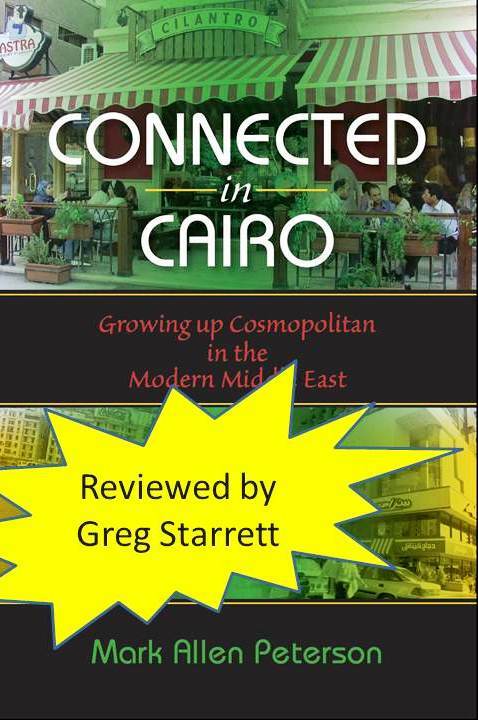 Which is a long, roundabout introduction to say that there is a new review of Connected in Cairo by Gregory Starrett in a recent issue of the journal Contemporary Islam. This book is an introduction to the way that ‘connectedness’ in its many senses is a key for understanding themarkers of socioeconomic class stratification and what many scholars call ‘neoliberal subjectivity,’ the cluster of aspirations, tastes, and capacities that define the self in terms of its role in the circulation of capital. Pursuing this argument about consumption as a fulcrum balancing cosmopolitanism and authenticity – the argument itself is not a new one, of course, but is laid out here in a style so clear and unaffected that it might serve as a model for good academic writing – leads us through Arabic children’s magazines, the social meanings of computers, Pokemon, shisha and coffee shops, linguistic code-switching, shopping malls, male sociality, international advertising campaigns for condiments, and the cutthroat competition between Cairo’s pizza restaurants. As someone who made my living as a non-fiction writer before I became an anthropological writer, those are extremely high accolades indeed. It is what I strive for in my scholarly writing. The implication was that the difficulty people have reading most anthropological writing has nothing to do with the epistemologies, conceptual categories, and careful parsing of our theoretical language; we were just bad writers who should just come out and say what we mean. (Like physicists. They should quit hiding behind all that mathematical gibberish and just write clearly so everybody can understand them). Journalists are smart, highly-educated people and are perfectly capable of understanding us. The main gulfs between us are epistemological and ethical, not poor writing. God knows economists don’t write in accessible ways and the media are all over them. Letting them know (through “clear writing” that anthropology has a better mousetrap doesn’t mean journalists will beat a path to your door. They have their own systems for gathering news, and they are usually not looking for better mousetraps, just ever more efficient ways to do their jobs. Empirical writing is easy; its just journalism and after 6 years and more than 1200 articles, I can do the journalism. But journalists conceal their assumptions and analyses behind their descriptive writing in the name of objectivity. Scholarship demands we make these assumptions and theories explicit, and that we unpack our empirical data by explicitly tying event and action to theory. This is the real challenge. Getting the balance of theory and description right is a delicate balancing act (and I definitely should share some kudos with my editor, Rebecca Tolen at Indiana University Press, who kept after me to get that balance right). Umm..okay, back to the review. Starrett, for those who don’t know, is former president of the Middle East Section of the American Anthropological Association (2009-2010), former editor of the Middle East Studies Association’s journal, and the author of a classic work on modern religious education in the Middle East, Putting Islam to Work: Education, Politics and Religious Transformation in Egypt (California 1998) (by “classic” I just mean that practically everybody cites this book). More recently he co-edited (with Eleanor Doumato) a comparative study of the religious curricula in nine countries entitled Teaching Islam: Religion and Textbooks in the Middle East (Lynne Reinner 2007) which, in the interests of full transparency, I will admit I have not yet read. This is precisely one of the reasons that Peterson’s ethnographic exploration of cosmopolitanism is useful for readers both within and outside Egypt. Much of the best ethnography illuminates the taken-for-granted elements of daily life, particularly those parts of our experience –such as entertainment choices–which we perceive as “meaningless” at the same time that we take tremendous care to calibrate those choices with our means and our aspirations. Peterson adds a particularly rich set of observations and analyses to a line of research established by other scholars such as Walter Armbrust, Samia Mehrez, and Mona Abaza. I would recommend the book for any general course in Middle East studies, anthropology, media studies, or globalization. The focus on consumption creates an immediate bridge of recognition for American and European students. It is a recognition that will help them appreciate that we all face many of the same dilemmas in thinking about our identity, and we are all enmeshed in complex webs of global flows of capital, commodities, and images. But, to use a Titanic analogy, although we may all be in the same boat, some of us are in fancy staterooms, while most of us are in steerage, way below the water line and without much hope of making it up the stairs once the iceberg hits. I would recommend the book for any general course in Middle East studies, anthropology, media studies, or globalization. ← Overdressed and Underexposed or Underdressed and Overexposed?